Leah Hogsten | The Salt Lake Tribune Rebecca Farnsworth of Sandy stays in the zone as the 90-minute class winds down. Students of Bikram Yoga in Sandy sweat through 26 postures and two breathing exercises in 90 minutes. 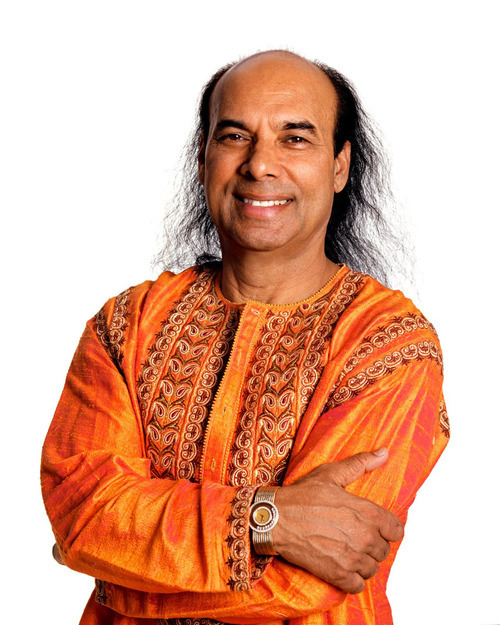 Bikram Choudhury, the founder of Bikram Yoga, will be making his first Utah appearance. (Courtesy of Bikram Yoga) Bikram Choudhury (Courtesy of Bikram Yoga) Leah Hogsten | The Salt Lake Tribune Sweat drips off Debi Muir as the 90-minute class winds down. Students of Bikram Yoga in Sandy sweat through 26 postures and two breathing exercises in 90 minutes under the watchful eye of instructor Jackie Wheeler. Leah Hogsten | The Salt Lake Tribune Ash Renee's hands and feet come together as she holds a pose. Students of Bikram Yoga in Sandy sweat through 26 postures and two breathing exercises in 90 minutes under the watchful eye of instructor Jackie Wheeler. Leah Hogsten | The Salt Lake Tribune Instructor Jackie Wheeler leads students of Bikram Yoga in Sandy. Leah Hogsten | The Salt Lake Tribune Students of Bikram Yoga in Sandy sweat through 26 postures and 2 breathing exercises in 90 minutes under the watchful eye of instructor Jackie Wheeler. Leah Hogsten | The Salt Lake Tribune Sweat drips from the chin of Alex Wheeler in the 100-plus degree heat of the studio. Students of Bikram Yoga in Sandy sweat through 26 postures and two breathing exercises in 90 minutes. Leah Hogsten | The Salt Lake Tribune Sweat drips from the fingers of Marc Linton. Students of Bikram Yoga in Sandy sweat through 26 postures and two breathing exercises in 90 minutes under the watchful eye of instructor Jackie Wheeler. Bikram Choudhury is the founder of Bikram yoga, a 90-minute practice of 26 postures and 2 breathing exercises in a hot and humid room. Courtesy Mike McInnis Leah Hogsten | The Salt Lake Tribune Students of Bikram Yoga in Sandy Jessica Olson, left, and Bonnie Williamson sweat through 26 postures and two breathing exercises in 90 minutes under the watchful eye of instructor Jackie Wheeler. Leah Hogsten | The Salt Lake Tribune Students of Bikram Yoga in Sandy sweat through 26 postures and two breathing exercises in 90 minutes under the watchful eye of instructor Jackie Wheeler, left. Leah Hogsten | The Salt Lake Tribune A pool of sweat forms on the back of Bonnie Williamson as she and fellow student Jessica Olson, in background, hold a positon. Students of Bikram Yoga in Sandy sweat through 26 postures and two breathing exercises in 90 minutes under the watchful eye of instructor Jackie Wheeler. Leah Hogsten | The Salt Lake Tribune Rebecca Farnsworth of Sandy stays in the zone as the 90-minute class in 100-plus degree heat winds down. Students of Bikram Yoga in Sandy sweat through 26 postures and two breathing exercises in 90 minutes under the watchful eye of instructor Jackie Wheeler. He's been called "boisterous," "controversial," "charismatic" and much worse. That doesn't bother Bikram Choudhury. The founder of Bikram Yoga College of India has, in his own words, "always had a big mouth." As a young man, Choudhury took an oath from his guru, Bishnu Charan Ghosh, to "help as many people as possible by sharing [his] Indian heritage and the wisdom passed down over the centuries." That meant Choudhury was to leave his native India and bring yoga to the West and America. Since his first Bikram Yoga College of India studio opened in Los Angeles in 1973, he's been doing just that. He's also been explaining to Americans why they all have so many health and personal problems and how the practice of yoga can create balance and healing  physically and mentally. The 66-year-old Choudhury will make his first Utah appearance on Saturday, April 14, speaking at Rose Wagner Performing Arts Center. Choudhury will talk about the challenges in America today  obesity, depression and divorce, to name a few  and how the practice of yoga can improve the body and mind. Choudhury's philosophy is all about using hatha yoga to empower oneself and "put you on the path to realize your true destiny, the realization of the godly potential we all have inside." What is it? •Bikram Yoga is a form of hatha yoga. In Sanskrit, "ha" means sun and "tha" means moon. The word yoga comes from the Sanskrit word "yuj" which means "to join and symbolizes union  a joining, or a marriage." "Through the physical practice of yoga, you integrate your body and mind in a perfect union," Choudhury says. Bikram Yoga is a sequence of 26 postures and two breathing exercises that take 90 minutes to complete. The yoga is performed in a hot and humid room (105 degrees and 40 percent humidity. "A warm body is a flexible body," Choudhury says in his book, Bikram Yoga: The Guru Behind Hot Yoga Shows the Way to Radiant Health and Personal Fulfillment. The heat also mirrors the practice as it would be conducted in the hot-humid climate of India. Bikram in Utah • Bikram Yoga has three Wasatch Front locations in Salt Lake City, Sandy and Ogden. A fourth at Thanksgiving Point will open in September. Jackie and Alex Wheeler opened Bikram Yoga College of Sandy in December 2003. Jackie Wheeler went to her first Bikram Yoga class with a pre-existing shoulder injury in 1996 and, through the physical practice of yoga, she was able to heal that injury while also discovering she had work to do mentally. To become certified teachers and open a studio, she and her husband both practiced more than 500 hours of Bikram Yoga. They started with nine weeks of intense training under the supervision of Choudhury and then apprenticed for six months with senior teachers before receiving Choudhury's approval to open a studio. They guide students through what Alex Wheeler says is a "vigorous, challenging and relatively intense practice." "Everything you do in the yoga room is going to help you in life, whether it's sports, relationships, work," he said. Adds Jackie Wheeler: "The physical practice of yoga concentrates on working on the different systems of the body, including cardiovascular, endocrine, respiratory, digestive and nervous." Joanne Dehlin, certified instructor and owner of soon-to-be-opened Bikram Yoga College of India  Thanksgiving Point, says Bikram Yoga "works from the inside out." Seven years ago, Dehlin had just completed a half marathon and decided she'd "never do that again." In addition, she suffered from carpal tunnel and had a ganglion cyst. At a fitness convention, she was introduced to Bikram Yoga. After that, she's never looked back, participating in a 30-day challenge  Bikram Yoga 30 times in 30 days. "As Bikram says, it's never too late, it's never too bad, and you're never too old or too sick to start from scratch once again," she said. When • April 14, 5 to 8 p.m.
"It's never too late, it's never too bad, and you're never too old or too sick to start from scratch once again." "Fire's got to burn, ice has to cool and Bikram's got to be Bikram." "Our mission here on Earth is to fully inhabit or to realize the awesome potential of our true Selves." "If someone steals your peace, you're the loser." "The purpose of yoga is to heal. Fitness is merely a by-product of this health-building process."